July 28, 2015 was one of those rare, warm, delicious evenings in San Francisco. We were working late in our home-office, windows open to the world trying, as many other San Franciscans, to cool our air condition-less house. Open windows after dark seldom occurs in our neighborhood in large part due to the powerful and cooling influence of the Pacific Ocean but also because our “nabe”, like many others here in SF, is transportation noisy. Mostly low frequency whooshes from the surface roads but also the occasional alarms, sirens, air traffic, helicopter rotors whooshes and general whoops and hollers of one of the mostly densely populated regions of the U.S. You can only pretend for so long that the white noise from Highway 101 is crashing ocean surf so 99% of evenings here our double-glazed windows are shut tight. This evening though, open windows allowed us to hear something extraordinary: a sudden hissing sound that although we’ve heard many times” in the field” just once before from this home in the early 90’s. It cut through the urban din loud and clear in two blasts: Noreen and I both exclaimed at the same time “Barn Owl!” Just as sudden a feeling of, well, happiness came over us. This wraith of a bird was out on a joy flight looking for some fine city dining or maybe a new friend. Since I was sitting at the keyboard I decided to share the joy on our local bird blog “SFBirds” and don’t-ya-know a fellow birder up the street immediately responded he heard it too. Then another person reported that they saw a Barn Owl, likely the same one, over the nearby ballpark as the SF Giants were losing a few feathers in their cap from a scrape with the lowly Brewers. It’s a small world when you can fly. Fortunately, many municipalities such as the City of SF, have become aware of these issues and are instituting IPM (Integrated Pest Management) policies that reduce the poisonous impacts on our urban natural pest controllers such as foxes, coyotes, raptors and owls. Other agencies are spreading the word and discouraging household use of these harsh poisons through education and legislation. Through the great work of enviro-minded non-profits and a few of the more enlightened agencies there is hope that Barn Owls and their kin will be able to repopulate areas in our urban margins where they were once well established. Great-horned Owls and Barn Owls are large, gregarious animals and therefore by far the most urbane of these primarily nocturnal wonders. For those same characteristics they are also the easiest for humans to detect. Great-horned Owls in particular are celebrated throughout San Francisco whenever their open nests are discovered. Sometimes the visitation and photography of owlets gets to worrisome levels for local birder conservationists but it is almost impossible to determine any long term effects on the birds. Other than glares by the adult owls they mostly seem to acclimate or at least become tolerant of human encroachments. One publicly known nest in San Francisco was abandoned after two productive years however and it could have stemmed from being overly admired. Other than these two magnanimous owls there are only a handful of modern records in SF for the half dozen or so other owls that inhabit the western region. This is not surprising. Owls are notoriously difficult to detect and most often done so by an alert birder observing mobbing behavior or the “intruder alarms” of the bird world: first alerters are often chickadees and/or titmice followed by other gleaners such as nuthatches, creepers, wrens, kinglets but also hummingbirds, thrushes and even woodpeckers will get involved. Remarkably these very different species recognize each other’s specific alarms calls, some to the intruder type level. For instance they may know if the alarm call is from a ground or avian based predator, from a raccoon or a raptor. There is a wide range of mobility among Western owls ranging from primarily sedentary species such as Western Screech-owl who may hold a territory year around but disperse post breeding to long distance migrants such as Short-eared Owl with some individuals breeding as far north as the arctic tundra then moving thousands of miles south to winter. So it would seem they would in the least pass through migrant heavy San Francisco and perhaps spend a night or a few. And most all of the western owl species do but, discovering rates are very low. Many of these seldom seen species are habitat specialists and rather picky about what or where they will hunt or rest. And, let’s face it, even marginal habitat is ever shrinking in development crazy San Francisco. 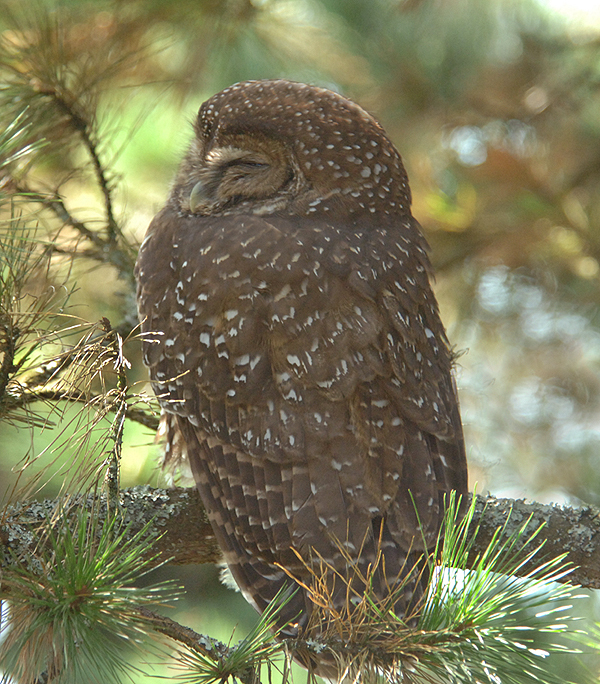 There are no modern San Francisco records of a couple of western owls who breed in Northern California: namely Spotted and Flammulated Owl. The next two species by size, the “Asio” Owls, have each been detected a few times in recent history. 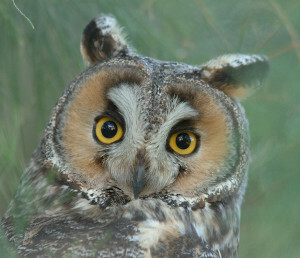 Most recently a keen-eyed birder located a lone Long-eared Owl in lovely Buena Vista Park in mid-December of 2009. A timely report on SF Birds got a bunch of lucky people to see it before it disappeared from there. The same bird, or, less likely, another one, showed up on Telegraph Hill about a week later. 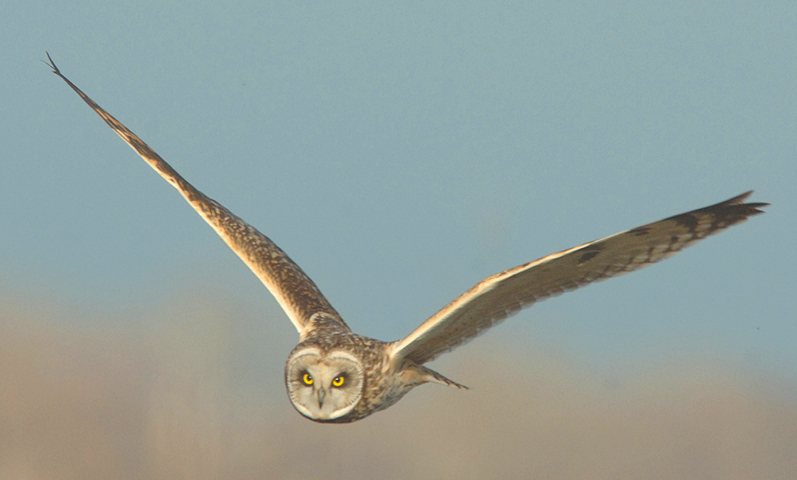 Close relatives to Long-eared Owls, Short-eared Owls are more numerous and widespread. They are known for roaming widely so not surprising that they are detected most years in and around San Francisco. Being crepuscular in nature Short-ears often fly during daylight hours and are occasionally seen from Hawk Hill in the Marin Headlands crossing the Gate into San Francisco by hawk watchers in fall. On November 15, 2007 in the early days of the salt marsh restoration at Pier 94 in San Francisco we had a glimpse of a Short-eared Owl fly up out of this tiny 4 acre site. Nearly two weeks later on November 28 we had much better looks at what may or maybe not the same bird at the same site. These unexpected sightings so close together here in the dense urbanity of San Francisco prompted us to look into their diet preferences and indeed shorebirds are high on the list: “chiefly Dunlin” said one report. Burrowing Owl, once an abundant species in California, is the next most reported owl in San Francisco. However, most all modern reports are almost certainly of a very few individual birds who wintered in San Francisco. One famously spent much of its winter days in the rocks just below the sidewalk at Land’s End parking lot being detected between 2006 and 2009. In 2008 the bird was unusually reliable sitting in front of it’s little rock cave. We sometimes set up a scope after birding the area and do what we were calling “random owling”. We’d ask visitors if they “want to see an owl”. A few would look at us like were were crazy and steer clear but most folks would “bite” and look into the scope. All of them, without exception, would get a bewildered smile and most of them commented that they “couldn’t believe their eyes” and switch from the scope to the rocks and back again. Quite fun! Other than one odd-ball Burrowing Owl sighting at the Embarcadero Street Bart station from November 2002 the few other eBird records are from open space areas along the coast and one from Bernal Hill in the fall of 2009. 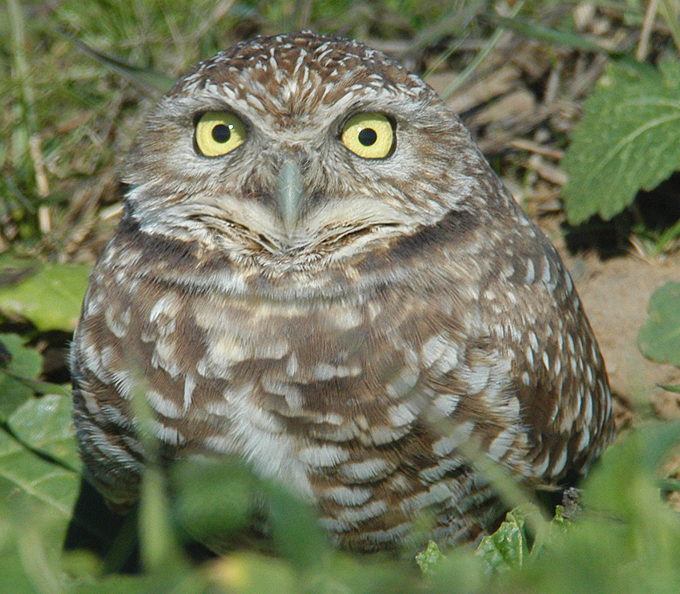 Of course there are many other records of Burrowing Owls and other owl species detected in San Francisco and the Bay Area from the past that have not been committed to public, on-line records for a variety of reasons. One reason is that modern public record sharing is a relatively new tool. Many veteran Bay Area naturalists and birders have kept only personal records and either haven’t adopted the sharing philosophy of the eBird citizen science effort or just can’t find the time (and patience involved) to enter their historic data. It wasn’t until January 1, 2013 that Noreen and I began using eBird exclusively for record keeping. It was a leap of faith to switch over but now we love it and are grateful to the tens of thousands of eBird subscribers for sharing their sightings and the volunteer data reviewers for their efforts for veracity of the reports. Better to lose a real sighting than muddy the data with possibilities. We use the “explore data” feature extensively especially when we travel. Still haven’t moved over our historical “Avisys” database records but that’s going to happen some day soon. Another loss of historical records via on-line sources is also due to lack of volunteer time. Until some very dedicated librarian-minded individuals dive into historic early ornithologists records like those of the “father of field journals” Joseph Grinnell and adds them to eBird or another shared database those records will be difficult to attain without a large expense of time, travel and access. There are birders, some very scientific minded ones too, that will not post some or any of their records. Some simply don’t want to spend the time, a very few don’t see the value in sharing the data and a few others may not welcome data reviewer oversight. Primarily, it seems though, this group doesn’t want their reports made public due to concerns over exposure to secretive or sensitive birding locations and more specifically concern of possibly taxing any sensitive species that they do report. There have been issues too. In addition to nest abandonment by a Great-horned Owl in Golden Gate Park possibly due to encroachment the Burrowing Owl at Land’s End was last seen at the same time as a photographer who climbed down into the area just below the wall to get a close up. Next day, no owl. 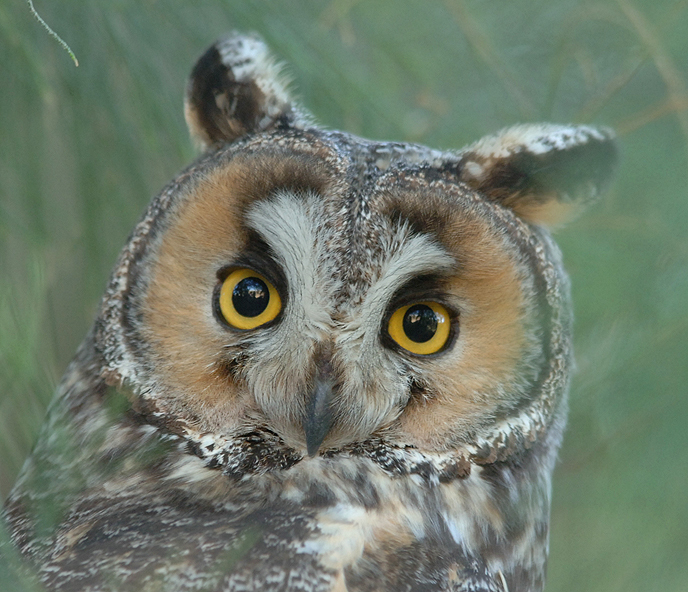 A story about a Long-eared Owl in San Rafael is particularly poignant. Arrived in early January of 2013 and was killed by a Red-tailed Hawk one week after it’s discovery. Many blamed over zealous birders and especially photographers for repeatedly flushing it from the little cover available at the site. The location was suddenly inundated with searchers. Perhaps a poor choice by the bird but did people influence it’s demise? Maybe, possibly even probably. All in all however there have been very few incidents considering the many new and easy ways people can find out about uncommon or rare birds. This is because almost everyone does care about these individual birds well being and become informed on how to minimize impacts. Birders in general are generally hyper-aware beings who are often focusing on little bitty sounds and movements. June 28, 2015: We live in a densely populated area with a Highway 101 off ramp leading onto our traffic heavy street. Not a quiet cul-de-sac and houses on our part of the hill are wall to wall. A small weedy half-acre Caltrans open space is just across the street below the freeway but most of the trees near here are exotic “street trees” planted in small square opening in the sidewalk. Small backyards collectively provide respite from the masonry and asphalt and species such as Mourning Dove, Anna’s Hummingbird, Western Scrub Jay, Mockingbird, California Towhee, House Finch and even Hooded Oriole nest regularly among the urban clatter. Pygmy Nuthatch, Juncos and Bushtits apparently nest in the general vicinity based on breeding period presence. Despite the marginal habitat our “yard list” which includes anything we see from our house is quite impressive especially if you are into raptors. This is primarily attributable to the view shed our perch on the north side of Potrero Hill affords with views from the Golden Gate across to the Bay Bridge and East Bay Hills down to about south Oakland on clear days. On this lovely June day we added the most surprising yard bird to date. 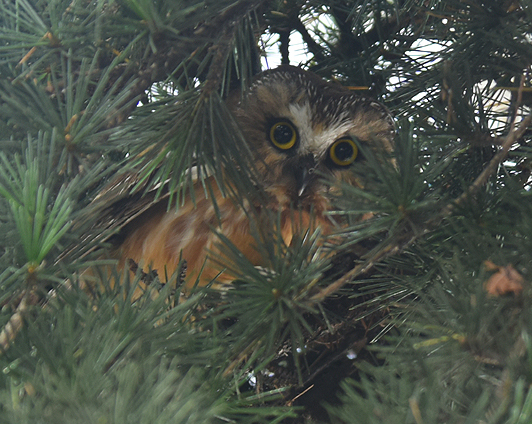 Returning from a foraging mission in the Mission, walking up the hill to our house loaded with groceries I noticed some owl type whitewash beneath a small street conifer, looked up and had a quite a surprise: a NORTHERN SAW-WHET OWL staring back at me. Quickly whispered to Noreen and we giddily admired it for a few seconds before moving on. I crept back a few minutes later with a camera and snapped a few documentary shots. As it turns out this bird had also been perching in the New Zealand Bottlebrush tree in front of our house evidenced by copious amounts of white wash and more dried out pellets that we just collected on our sidewalk. Not entirely sure how long it had been hanging around but, about a week prior while chatting with my next door neighbor, I had noticed some mixed mobbing going on: Chickadees, Bushtits and Anna’s Hummers all raising a ruckus in the Bottlebrush tree. Took a quick look but didn’t see anything – it is a very dense tree. Thinking back they may have been (or probably were?) mobbing the owl. As far as we can find this is the first summer breeding season record for a Northern Saw-whet Owl in San Francisco. The presence of the little gnome like bird raises many more questions than it answers of course. Is it an early breeder that dispersed, a failed breeder that gave up? Where did it come from: nearest known breeding areas are in Marin (Muir Woods) and to the south in the Santa Cruz Mountains. Or, perhaps it has been around since last winter. But why such a marginal habitat choice – busy, noisy, high amount of human traffic and very little vegetated space? Surely one of the large parks would be better hunting and cover. And what has it been eating? Based on the number of pellets we found it has been successful on that end. 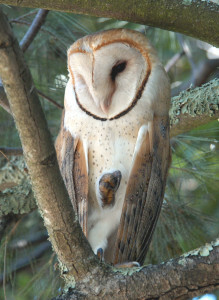 Hoo knows what critters are lurking in our street trees?